US 2009-03-23 700 points ? EU 2009-07-10 700 points ? AU 2009-07-10 700 points ? EU 2017-02-02 £6.29 €6.99 ? EU 2014-04-30 £1.89 €2.49 ? 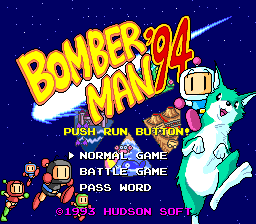 Bomberman '94 (ボンバーマン '94) is an entry in the Bomberman series for the PC Engine. Main article: Bomberman '94/Magazine articles. Sega Retro has more information related to Mega Bomberman.